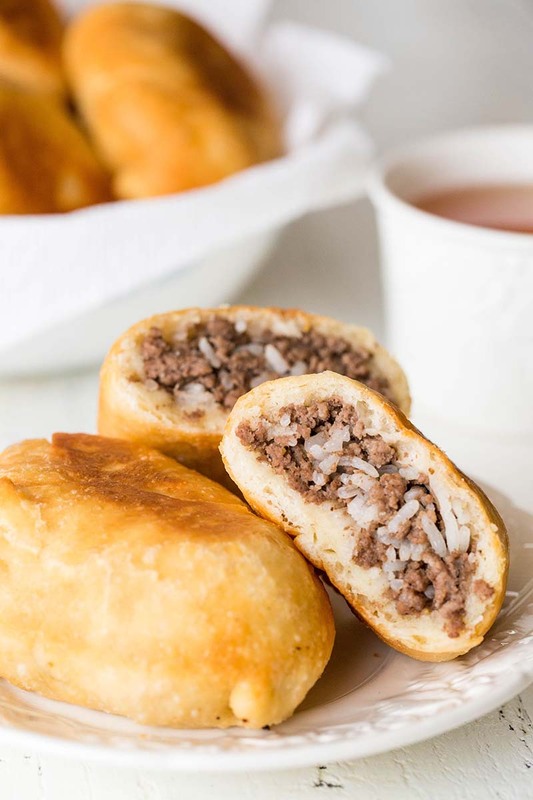 Perfect for picnics, potlucks and dinners at home, these Russian piroshki (meat hand pies) are made of tender and soft dough, filled with simple meat and rice mixture and fried till crisp golden perfection! Coat the dough with a little bit of vegetable oil and place it back in the bowl. Cover with damp kitchen towel and place it in a warm place to rise, for about 30-60 minutes. To make the hand pies, take a piece of dough and flatten it with your hands. Put the filling in the center and fold the dough in half. Pinch the edges of the dough to seal, creating a half moon. Then gently flatten it between your palms, making sure the sealed crimps are on flat side. To cook the hand pies, drop 4 hand pies in the hot oil and cook until golden brown, 3-4 minutes. Flip and cook until it's nice and golden. Remove into a bowl, lined with paper towel to absorb excess oil. Continue with the remaining batches. Recipe created by Sweet & Savory by Shinee. As an alternative to frying, you can bake these at 350°F for 20-25 minutes. Any ideas for vegetarian fillings? I would recommend experimenting with some of your favorites. I made these today! Turned out perfect. Changed one thing to the dough- added 1/2 tsp of sugar to foam the yeast. Also- added onion and cheese to the meat. It was my very first time trying them, and they turned out great. you can mess around with the sizes and see which size you like best. Put in a little more filling than you would think, they puff up nice.